Editor’s Introduction: In this week’s Magic Oddica TheMisprintGuy looks at a couple of Magic cards that were damaged by the printing and packaging machines, other than being crimped. Check out Chapter XXIII of Keith Adams‘ Magic Oddica to learn all about these unique misprints! As a magic player, especially one who has played for several years, have you ever stopped to ask yourself, “just how many packs have I opened?” Drafts, random purchases, and gifts at Christmas, the packs continue to all add up. Now let’s think for a moment here. There are allegedly 12 million active players in Magic: The Gathering right now. Once we start doing some rough math, it seems quite apparent just how many cards are printed each year. And if you have read anything I have written by now it is quite apparent that in the millions and millions of cards that are manufactured, sometimes things can go wrong. This time I had to cover something a bit broad, but apparent to many of us. Sometimes, the machines on the manufacturing line can screw up individual cards, besides just the machines that crimp the packages closed. Nicks, scrapes, odd things that immediately reduce the value of your cards before you even have a chance to do that yourself. Unless you witnessed a damaged card being opened yourself, most of these would look like a mishandling of a player. But, sometimes the mistake itself is odd enough that it is only able to have been done by a machine. Take, for example, the two scans I have shown here. The damage on the Scalding Tarn is so odd that it was only able to have been done by a machine. The art was smeared and damage was done to the corner, only possible while the card had just been printed. On the Omen Machine below, it has odd rolling marks across it. I witnessed this being opened in a draft, so I can testify to its legitimacy, but this could be faked. Many mistakes like this can, lending little value to it because of this. So in short, many cards can end up damaged in different ways, nearly every card I have seen is slightly different than the last. 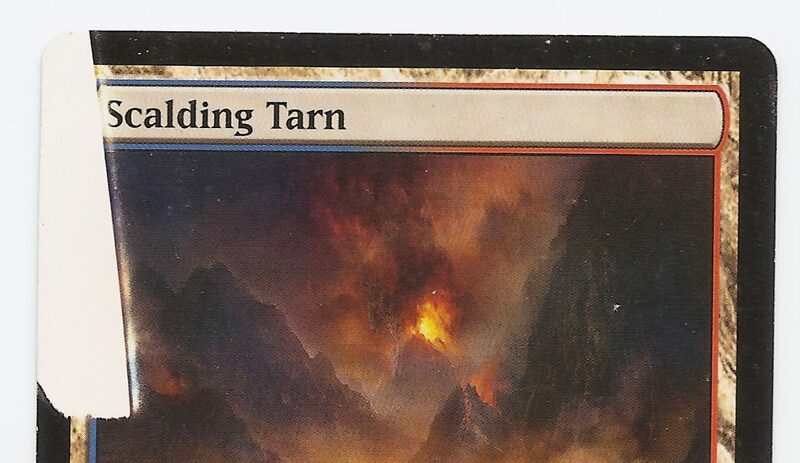 The Scalding Tarn is a rare example of a factory damage that could not be easily faked, but this is a rare example Sometimes, small things like these misprints are a bit of a disappointment, if they are easily faked they have no value, and also could be damaged enough to be considered marked cards. As always, I have a video featuring these cards. You can get a better look at them as I hold them in hand on camera, a bit easier to see than the scans. Until next time!